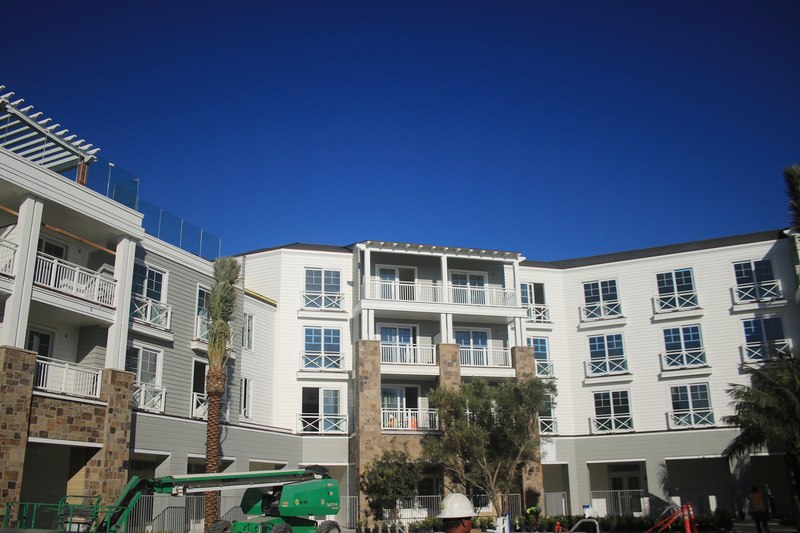 Lido House Hotel, the boutique hotel on the Balboa Peninsula, is nearing completion. A small hard hat tour got a behind the scenes look at progress on Wednesday. Olson joked with guests to “take mental notes” of features at the hotel and then look for them at his house. There were several style and architectural details at Olson’s home that were similar to the hotel, including the stone, front door, captain’s table, outdoor fireplace, design of the windows, and the overall architectural theme. There are even four topiaries on the front lawn that will look very similar to a set on the Lido House lawn. Possibly the most notable parallel is Olson’s preservation of mature, significant tress at both locations. At Lido House Hotel, local residents requested that two large “landmark” ficus trees remain on the property. Olson worked hard to include them in the design. They stand in front of the hotel, where a large wood deck will stretch beneath them with seating for people to sit and relax. Lights hanging down and a large lawn with artistic landscaping will create a comfortable atmosphere. Bob Olson, CEO of R.D. 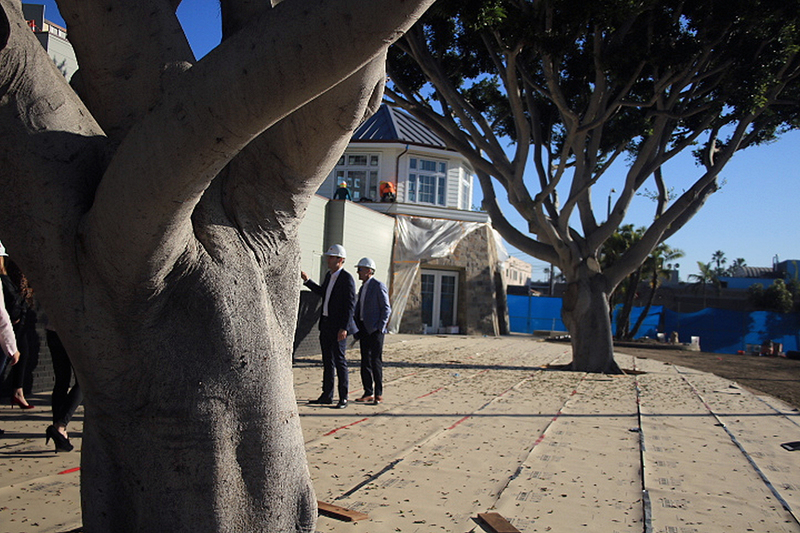 Olson Development, and Adam Beer, Lido House General Manager, talk to a small tour group on Wednesday from the wooden deck surrounding the preserved landmark ficus tress. At Olson’s home, a nearly 60-year-old olive tree stands in the front yard. It could have been removed to expand either the house (redone about 10 years ago) or the lawn, but Olson thought it was worth saving. “It’s a beautiful tree… It belongs there,” he said. 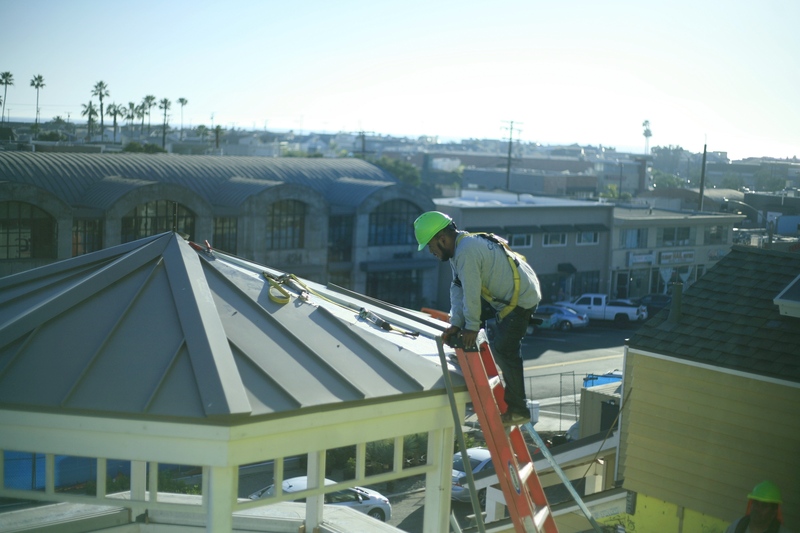 Lido House will offer 130 guest rooms, including one presidential suite, several executive suites, and five unique, custom designed three-story cottages, all set on a 100,000-square-foot lot that formerly housed the old Newport Beach City Hall. The hotel, situated at Newport Boulevard and 32nd Street, will be operated by Marriott as part of the company’s Autograph Collection. “It’s really coming together,” Olson said. 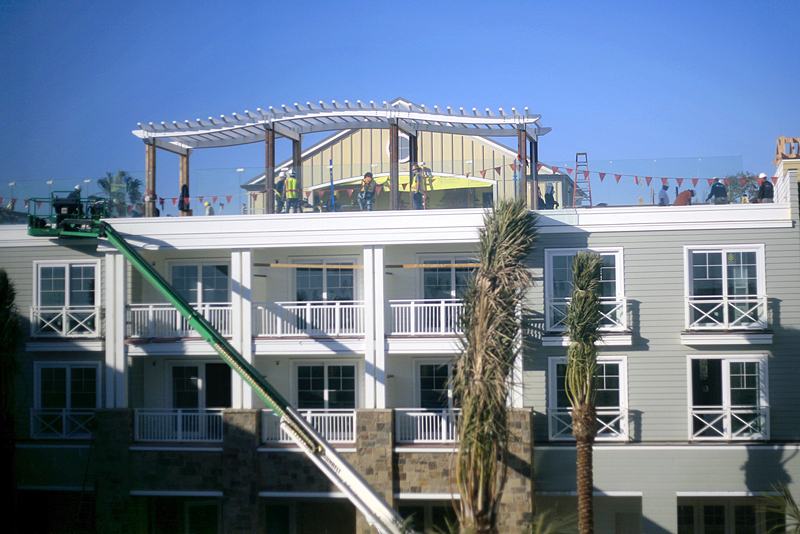 The hotel is scheduled to open in late March to early April. “We look forward to opening our doors in less than 60 days,” said Lido House General Manager Adam Beer. Project architect Greg Villegas of WATG was also on hand on for the tour and said they were excited to see the hotel coming together. All the details, architecture, dining opportunities, and design, all help create the overall experience, he noted. Beer, who was dressed in one of the David August designed uniforms that the hotel staff will wear, said they have already hired about 30 workers and are looking to add on about 70 more. 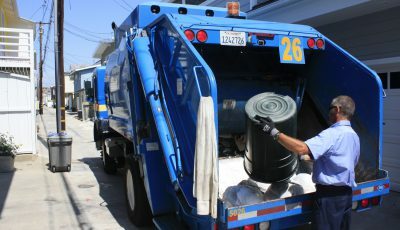 A hiring event is planned for Monday from 10 a.m. to 3 p.m. at Marina Park. 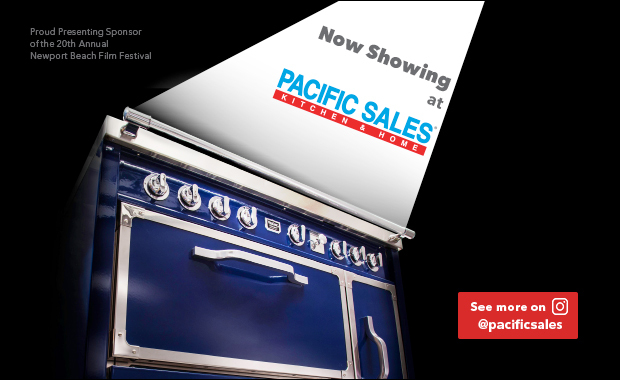 They are focusing on hiring locals as well as using local vendors. 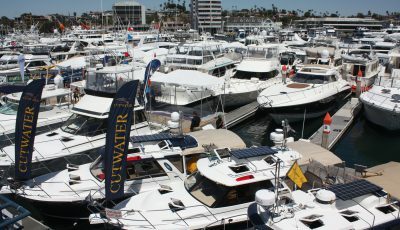 There will be a lot of design features, including artwork, from the surrounding community and Newport Beach, Olson said. 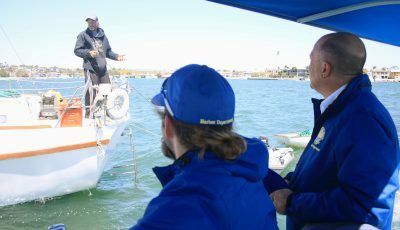 “So when you come here, you’re going to feel like you really have arrived in Newport Beach,” Olson said. In the lobby, there will be a ship model with ties to Newport Beach and history in Newport Harbor. There will be a special unveiling ceremony not long after opening. But both Olson and Beer were tight-lipped on the details. “A surprise is coming,” Olson teased. The attention to detail is incredible, Beer said. Olson’s passion has shined through in the project, which is full of personal touches from him. There will be a few different dining experiences, explained Executive Chef Partner Chef Riley Huddleston. 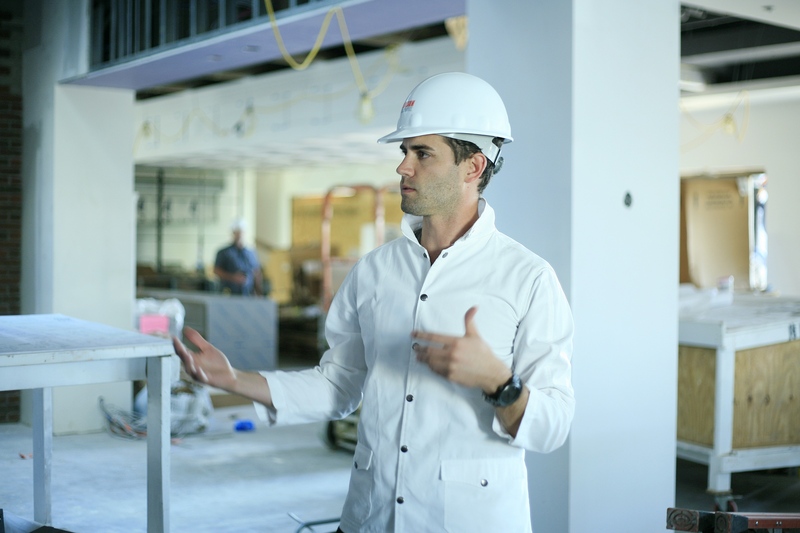 Lido House Executive Chef Partner Chef Riley Huddleston explains the “creative culinary” planned for the hotel as he stands in the middle of that will be Mayor’s Table, the hotel’s full-service restaurant. In a nod to the former use of the site as city hall, the hotel’s full-service restaurant is named Mayor’s Table, which will offer inventive cocktails and seafood oriented fare. They expect about 75 percent of the restaurant guests to be locals, Olson said. Olson called the menu “creative culinary,” which proved to be true during a small tasting at the reception. Also in the open layout restaurant is a space just off the bar that features a fireplace and brickwork leading up to a high ceiling. The captain’s table can seat 14 and a chef’s counter (which will feature a tasting menu) will seat seven. 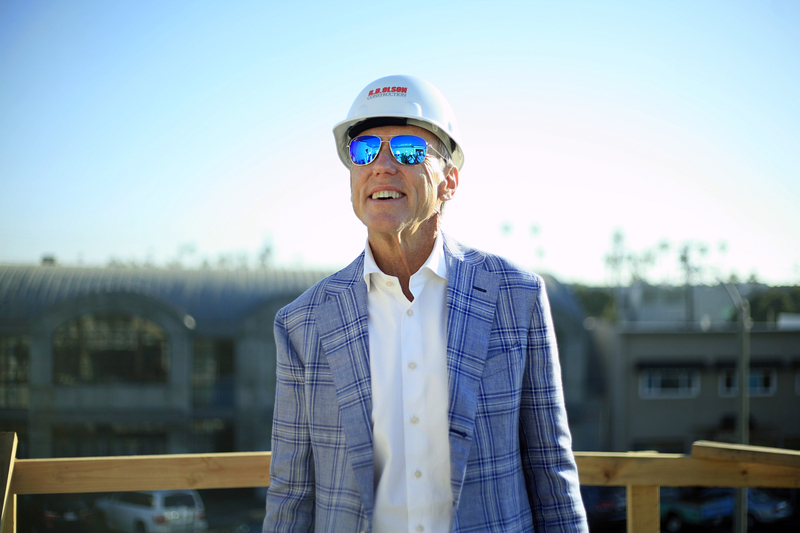 Crew Coffee + Cremerie, which will be situated in the lighthouse on the corner of the property, will offer coffee and ice cream, including their own “Lido Bar” (their take on the classic Balboa Bar), Huddleston explained. Topside, the rooftop bar, will be “champagne focused” to emphasize a celebratory ambiance, Huddleston said. Newport Beach is the number one consumer per capita for champagne in the U.S., he added. 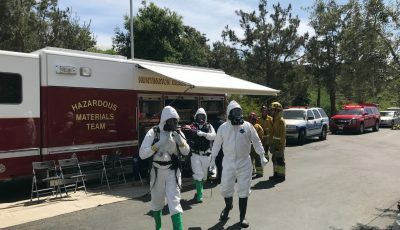 “So we might as well take that and run with it,” Huddleston said. There is an extensive champagne list for the rooftop, but the highlight is a custom blend that Huddleston made specifically for Lido House Hotel. He flew to Reims, in the Champagne province of France, to create it; which makes Lido House the first hotel in America to have their own champagne blend. The only other property in the world that does it is in Singapore, Huddleston said. Although the signature champagne won’t be in Lido until June, and although it’s limited in quantity, they already have a plan to reserve cases to have as an ongoing selection, Huddleston said. He’s also hoping for champagne dinners a few years down the road. The custom Lido champagne blend really vibes with what they’re trying to do overall at the hotel, he added. Other highlights include, a saltwater pool flanked by private cabanas, a high-end fitness center, Boost Spa, as well as 15,000 square feet of indoor and outdoor events space – including a ballroom and three event lawns. Online reservations are available for dates after April 14. For more information, visit lidohousehotel.com. Bob Olson, CEO of R.D. Olson Development, the company building Lido House Hotel, looks over the project from a balcony of one of the unique, custom cottages. 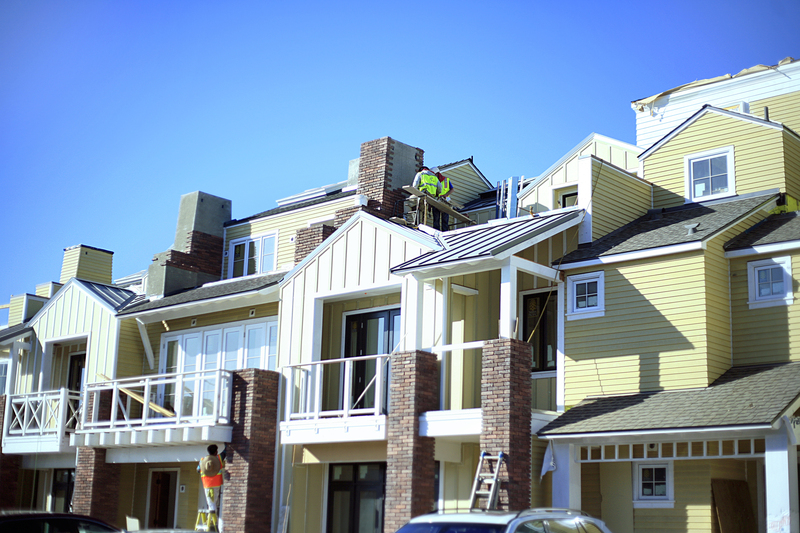 Workers put the finishing touches on one of the five unique, custom designed three-story cottages at Lido House Hotel, a boutique resort opening in about 60 days on the Balboa Peninsula, during a sneak peek tour on Wednesday. 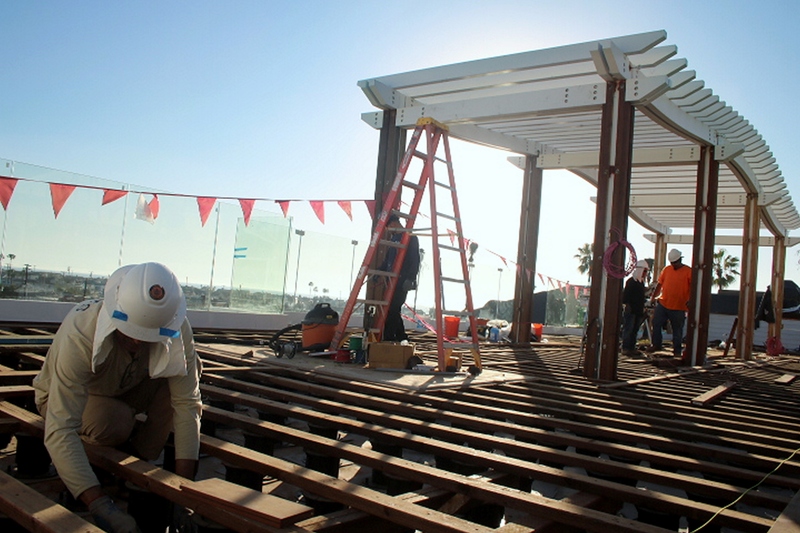 A worker constructs the deck for the rooftop bar at Lido House Hotel on Wednesday. 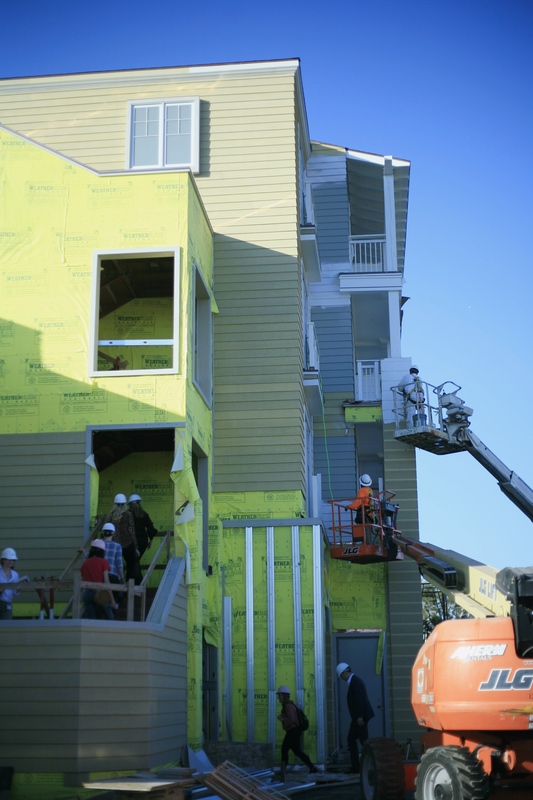 Builders hand off material as they work on Lido House Hotel on Wednesday. Tour guests climb the stairs into one of the five unique, custom cottages, as workers paint the outside on Wednesday. 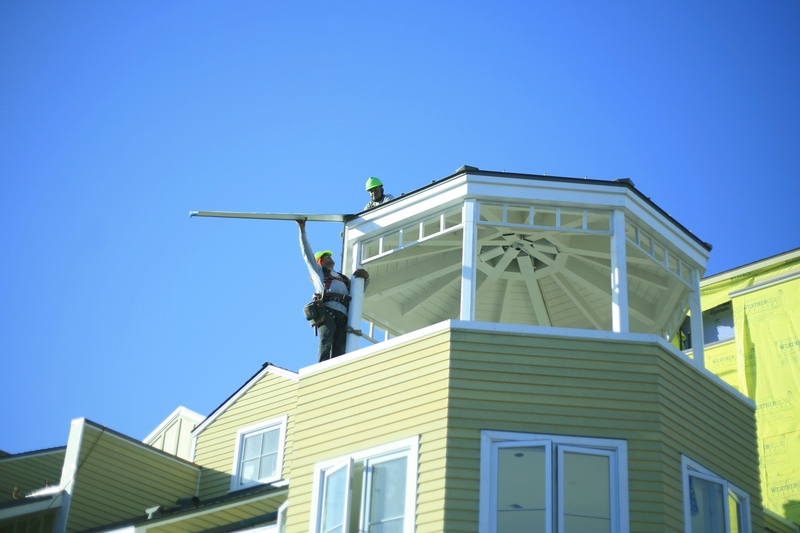 A worker climbs onto the roof of a gazebo near the cottages at Lido House Hotel on Wednesday. 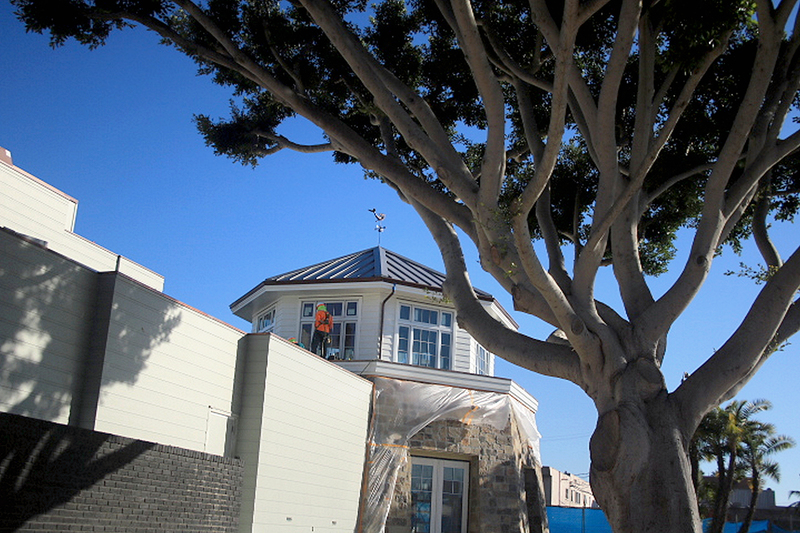 Workers make the final touches on the lighthouse shaped coffee shop, near one of the preserved ficus trees at Lido House Hotel. 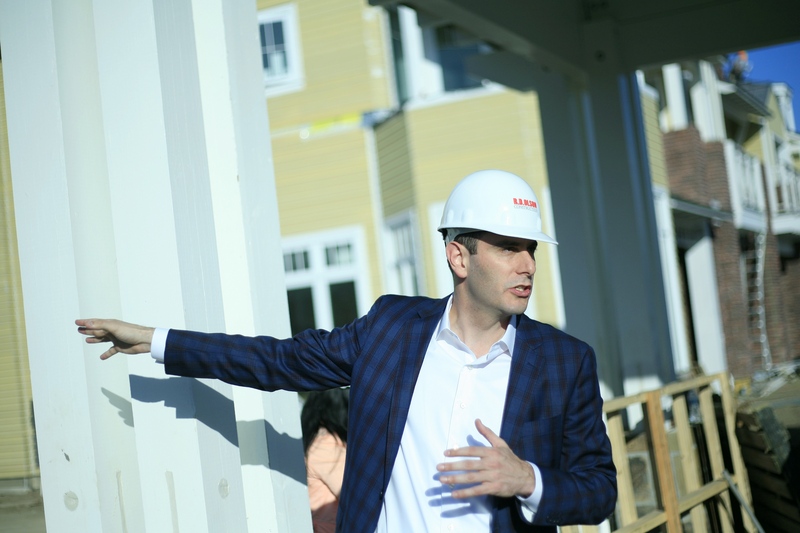 Lido House General Manager Adam Beer points out features of the hotel during a sneak peek tour on Wednesday. 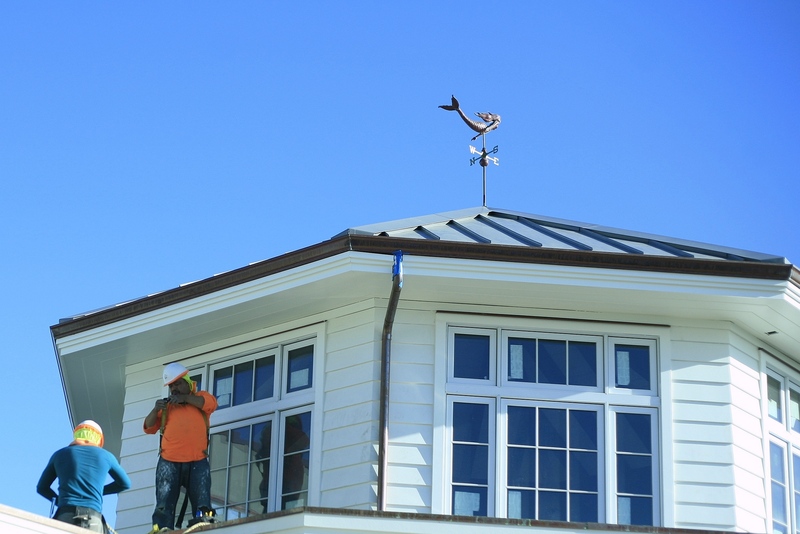 Workers put the final touches on the top section of the lighthouse-shaped coffee shop as a mermaid weather vane points the way. 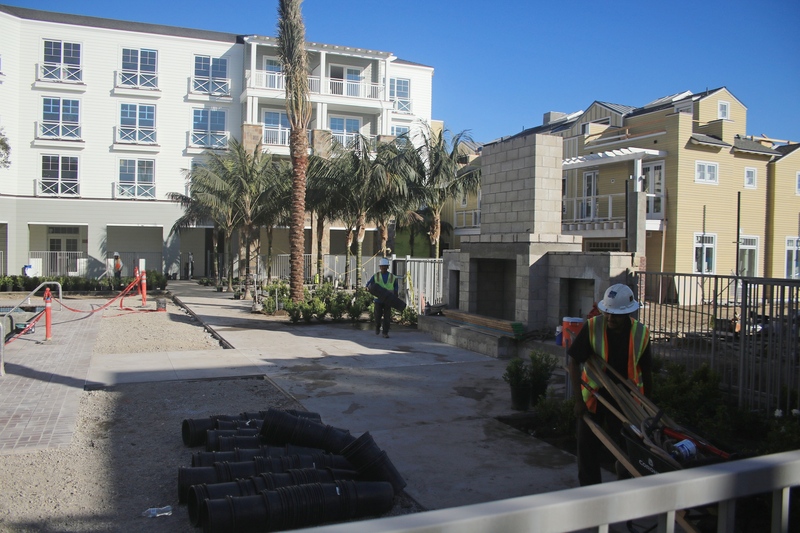 Builders work on the outdoor courtyard and fireplace at Lido House Hotel on Wednesday. 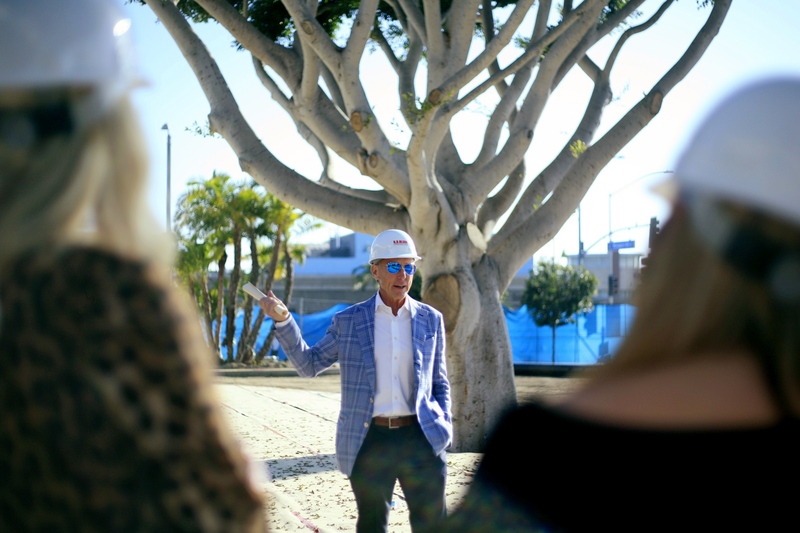 Bob Olson talks to a the tour group on Wednesday from the wooden deck surrounding the preserved landmark ficus tress.